Good photo; is it yours ? I now see a door at the uphill side of that little semi-subterranean (?) volume . . .
Oh, I'd forgotten to credit that photo (which I've gone back and done). Speaking of the grand unbuilt Draughting room, what is the word in the courtyard below it on the drawing? It's superimposed over the stone pattern and hard to decipher. Well, now I see ... It's "modeller's court". It's next to "modeller's shop". I guess he envisioned a big outdoor area for model building (presumably not in winter). A precursor to the Broadacre City model built outdoors in Arizona? Fascinating, isn't it ? It took me a bit to notice and then decipher that note (the lettering on this drawing, which must be in Wright's hand (? ), is peculiar). Modeling ? In the 'teens ? Nothing of the sort was in fact built, in any event. Most strange, to me. The studio as built is far superior to the overly grand structure in the plan, which would have overwhelmed the residence. Posted: Sun Oct 21, 2018 12:33 am Post subject: JJM2! Nice work on the model. What filament did you use? Do you have any plans to upload the file for others to print? Some additional images showing model details. Again, the tolerances for 3D printing regulate model detailing and thicknesses. These images are also renders of the computer model, which is still in progress. Working on this model, I have come up with some lingering questions and personal observations regarding T1. My apologies if any of the following ground was previously covered by members in this forum. 1. There are images of the courtyard in which you can make out some vague details of this entry over the terrace wall. See book Building Taliesin, by Ron McCrea, pg.185 for one photo that includes this area. I currently have this as a floor to roof overhang wall screen, but do not have firm photo evidence of such. Any other reference of this area? How about looking out from the interior? 2. There are photos where you can catch a little glimpse of this secluded nook. See book Wright Studies: Taliesin 1911-1914, by Narciso Menocal, pg. 129. The photos I have found show no evidence of the L-shaped "seating" indicated on the June 1911 plan and this model. Maybe the seating came later? Could this area have been originally intended/used for afternoon tea? Why this secluded, terraced nook? I ask because the June 1911 plan does not show the steps leading up the hill to the now famous tea circle. Perhaps FLLW needed a little more prospect with his tea, so he built the hill top tea circle. Just speculation, of course. 4. I am curious when the tea circle fountain first appeared. Did it appear in T1? 7. Any photo reference of this area for T1? All I could find was an interior shot when it was used as a workshop during construction. See Building Taliesin, pg.69. You can see outside one door to a very faint bank of...doors? There is a faint hint of mullions that continue down past the typical window sill height. Or, is it just me? 9. I am a bit confused by this studio entry area. There appears to be a vestibule entry in photos that does not appear on the June 1911 plan. Ditto for the adjacent terrace steps and corner planter (see 8). I wonder if these were both added after 1911? Or, are they all original improvisations? 12. There is one photo that covers this area in Building Taliesin, pg.88. Get out your magnifying glass. Any post cards, family photos etc. that include this area in T1? The model reflects my reading of that photo, the June 1911 plan, as well as some drawn T1 elevations that have been partly erased. 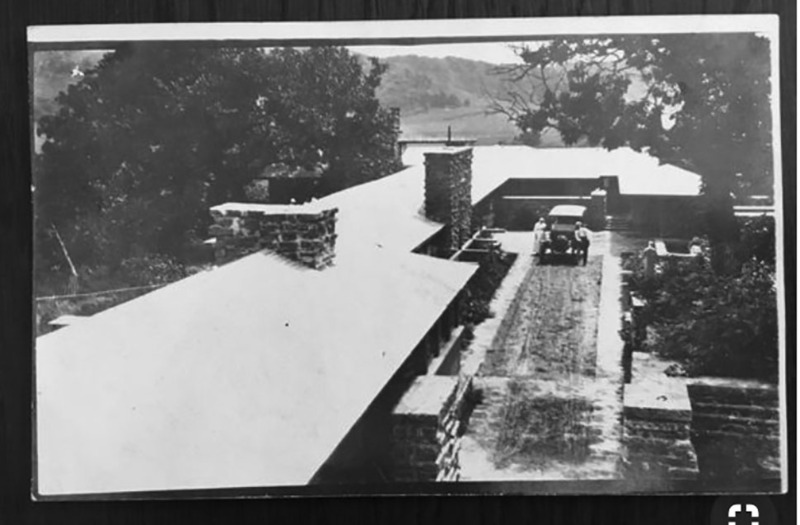 See Wright Studies: Taliesin 1911-1914, pg. 105 for those elevations. 14. I am personally curious about the tower balcony. Was this connected to a living quarters above the "milk room"? Also, I recently spotted a slight jog in the long parapet wall that is not reflected in the model. See Building Taliesin, pg.181. Any other reference for this wall? 15. More holes in my reference for this end of the balcony. Any photos of this area as built? Thank you for sharing your very nice work with us. 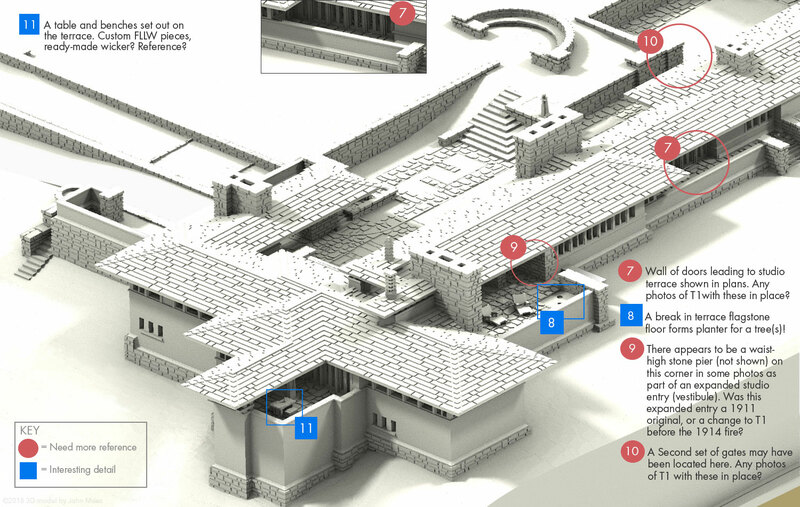 And by the way, that particular aerial view from west looking east (the 2nd of the images you just posted) is my favorite -- the most attractive composition view I've seen of any iteration or version of any of the Taliesins. Indeed; that view makes the most of Wright's interpenetrations and crossings . . . while revealing architectural detail not usually visible, and without the inclusion of the off-angle additions to the "farm" end of the complex ? In that aerial view, the logic of the planning is clear -- residential quarters on the east, catching the good light and enjoying the view. The perpendicular wing containing studio (and reportedly the almost-as-good living quarters of the architect's mother). Then, perpendicular again, is the working end of things in the tower wing with various agrarian functions aggregated there. Almost feudal-like, the driveway enters on one end, passing thru the tight squeeze of the porte cochere into an inner sanctum before narrowly turning and wending its way thru and out the other tight squeeze of a passage under the working wing. Presumably no expectation, hence practically no provision, was made for quantities of guests needing parking space. Heck, cars barely existed. It was an introverted, almost defensive, compound. Later... in addition to FLW's desire to experiment and to create ever more complex interior volumes, the exterior functional needs evolved into an extroverted affair as appendages reached out beyond the original redoubt. The Car, along with its driveways and parking needs, was banished from the inner sanctum -- cast out to hang with tenuous purchase to the side of the hill leaving the approacher, once on foot, to skirt the outer edge to find an almost tangential angle of attack diagonally across the cascading entry stairs. It became very different, but also marvelous just the same. Nicely delineated. The transition itself is remarkable, I suppose; how many buildings have been reconfigured in their direction and manner of approach so thoroughly as this one ? than most. By my reckoning he was 44 when Taliesin was initially constructed. 1.) A short screened section was added below the eaves probably in the summer of 1912 at this interior access and access to the kitchen ice box from the court. A similar screen section was added at the same time to the primary entry next to the living room fireplace. 2.) There were stone benches along the walls of this terrace. Tea probably taken here, but assume the main purpose was to add a feature that screened the garden court as you approached along the drive and through the porte cocheres. This area was near level with the courts, and downslope from the hilltop. 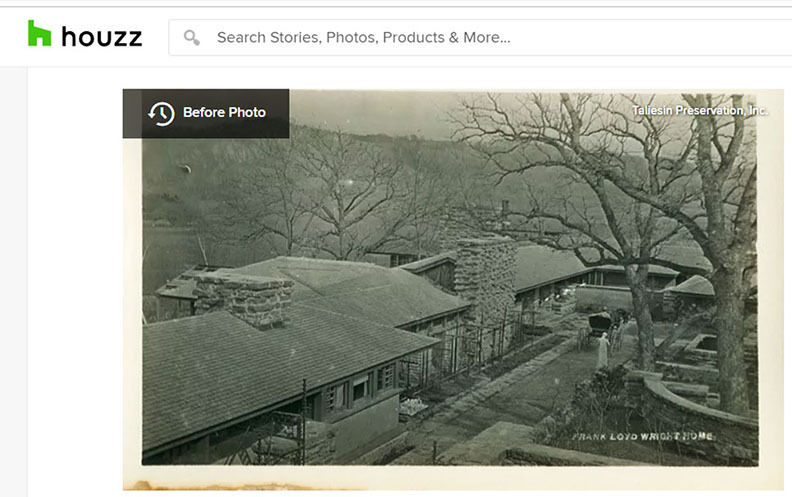 The 1911 photos are of a Taliesin being built on the fly. Wright's design for the built relationship of house to hill was an ongoing process throughout construction, especially and primarily accessing the residence. I'm sure it became clear as he excavated and fleshed things out that access between the hill and garden court was a necessity, with the tea circle a logical addition to mark the transition between the "untouched world of nature and the ordered world of man", as Neil Levine put it. The circle was completed in the spring/summer of 1912. 4.) A hydraulic ram pumped water from the water feature below Taliesin up to a reservoir on a hill behind Taliesin, which was higher than the Taliesin hill top. From there it was gravity fed to the residence and courtyard fountains, etc. 5.) As best as I have found, this feature was closer to my SketchUp model and not a complete 180 degree form. 6.) The iron gates here and between the garden and work courts were added by 1914; I don't consider them a significant aspect of Taliesin 1. 7.) I agree the construction photo seems to indicate doors, but you'd think the man in the background would be washed in more sunlight considering how bright the terrace appears to be. That is a very tight work area, and there are the two generous sets of doors to the same terrace from the studio. I'm not aware of any other photos of this area. Windows were indicated on the contemporaneous dimensioned plans, so I left them in my model. One of the very few details I still have questions about... but just about ready to revise my model. 8.) Yes, there are photos of a tree in the planter. 9.) There was never a vestibule in the T1 studio, only the Dutch door farther along the wall below the entry loggia roof. A low stone wall and steps to the hillside beyond the planter were part of T1. 11.) Other than what was built in, Wright designed pieces were originally only in the dining area, bedrooms, and misc. print stands. 12., 13.) Oh boy. 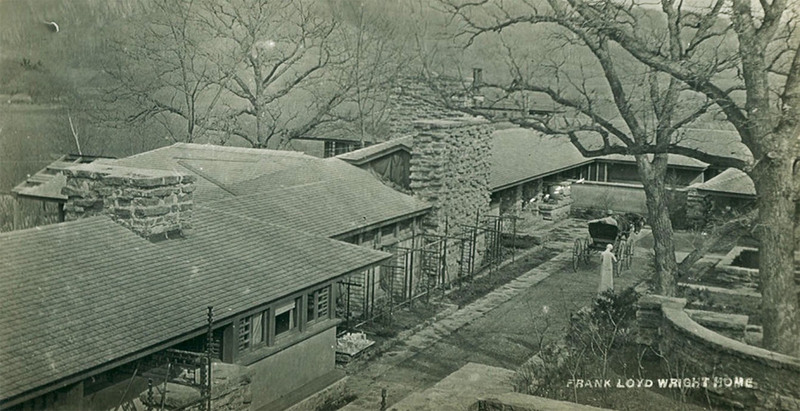 This area was always a conundrum until Randolph Henning's book of Taliesin postcards. Other than the garage at one end, the upper level of this wing was a hayloft, and the windows shown in early renderings were inaccurate. This is clearer in many other photos on the garden side once you see this elevation in Henning's photos. The walls were horizontal planks with space between them for ventilation. The wall did not jog in and out and was flat along it's length. There were no windows in the lower section of the hipped roof extension, either. The roof was actually completely cantilevered over an open-air, walled section for horses with a gate in the wall along the passageway. The stables were behind that section below the hayloft. To the right of the passageway was a door for the cows (where you are showing the first window)....the parallel low stone walls are erroneously indicated on plans. Once past the "cow door", the ground level elevates considerably with a masonry retaining wall extending out from the building more or less where the second window is shown. 14.) I know nothing specific about the tower, other than it anchors the entire composition to the hilltop as Taliesin pinwheels about its site. I'm not sure Wright even had another initial purpose for the tower room other, than placing a door at that level to access it. The tower windows at the top level were not installed until 1912-1913. To the right of the door, the section that wraps around ("jog"?) may have had separate access to the tower area on the other side of the fireplace; only speculation. I'm thinking you might not be aware one could access the tower door from the balcony outside the hayloft level, and that's not a closed off balcony at the tower...the exterior stairs up to the tower were located behind that wall section with the three openings. 15.) This end of the hayloft balcony also contained stairs which accessed the garage/carriage bays below as well as the horse stables under the hayloft. In your last detail view #15, there is a window in the bathroom that juts out next to the masonry piers of the studio terrace. Perhaps SpringGreen can add to, or correct, to both our advantage. I know zilch about 3-d printing and with absolutely no criticism intended, I would only make one comment. Regardless the state of, or limitations, of 3-d printing, the accuracy and clarity in some regards is very appealing. Still, I feel if the roofs were printed without shingles and perhaps the masonry without rocks, there would be a much better representation of the whole as a visually pleasing composition. Scale, IMO, is just as important in those respects as it is to the plan or terrain. 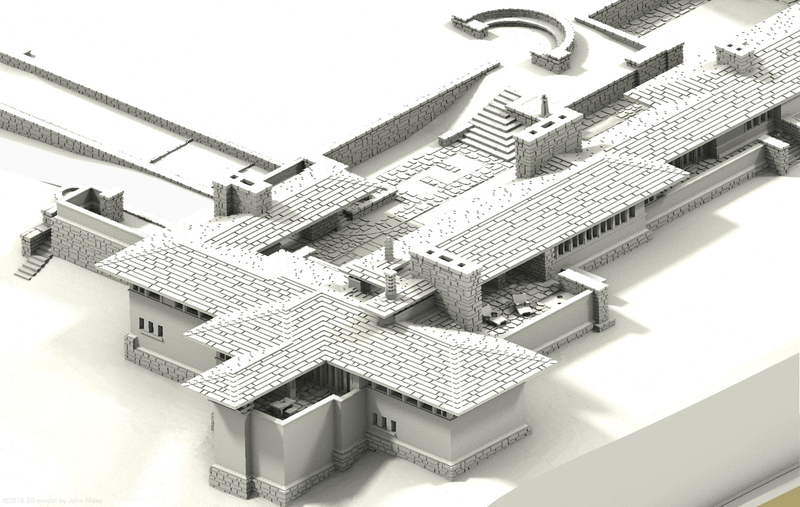 Without the benefit of scaled detail (common in any basswood model), I would think the forms of Taliesin alone would be enough to convey it's near perfection of interlocking transitions. Thank you all for the thoughtful comments and observations. And, thank you JimM for taking the time to share your deep well of knowledge on this subject in such detail. I am excited to dig into all the great information and leads you provided in the coming days. I also look forward to spending some time studying your model. So great! Now, I am off to get the Taliesin postcards book. I feel like I've seen just about all the old photos of Taliesin in the books and websites, but then I see an image new to my eyes on someone's Pinterest board. It reminds me of the interesting 3D model of our thread. This is a particularly interesting image. See the driver of the horse & buggy. Could that be Mr. Wright? Come to think of it, could that be him & Mamah leaning against the automobile in the first photo? I hadn't before noticed that there were two big oak trees in the courtyard - not just one. See the construction occurring on the gable on the left edge of the photo. What's going on there? Which part of the building is that? See the high window beside the studio's chimney -- it appears to have some sort of tarp draped over the window opening. "In what must have been one of the most bizarre travel experiences ever, Mr. Cheney, husband of Mamah and father of the two slain children, accompanied Wright on the trip from Chicago to Wisconsin."